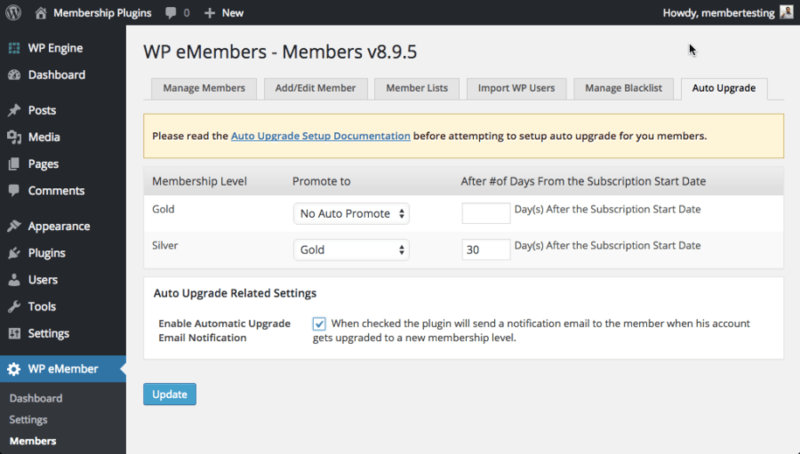 In my first review, we looked at wpmu dev Membership 2 Pro. It had a free and a Pro version. You had to pay monthly if you wanted updates for the Pro version. The plugin we’re looking at right now isn’t like that at all. Only one version. One time fee. Free upgrades and updates for life. That alone might have you jumping over to check out WP eMember. As I scored the previous plugin, I looked at 8 different factors and I thought I would walk you thru some level of details on those factors before we dig into WP eMember. These two criteria almost sound identical but they’re not. Ease of use is all about the “predictability” of the plugin. Are the names of the different features and configuration easy to understand? Does the software work in a way you can predict? Are the screens well designed and easy for someone who isn’t an expert? How overwhelming is the settings page? Speed to configure is something different, but related. The issue here is that even if you know how to do what you want to do, can you do it quickly? It presumes proficiency at the task and then inquires as to the velocity of the effort. Can a single registered account holder exist in more than one membership level or group at the same time? This is often a critical need when someone is using a membership plugin to deliver protection over course-related content. Just because you’re in one membership program (writing your first book) doesn’t mean you may not want access to another (learning how to shoot videos for YouTube). The core of the question is whether a variety of gateways are supported. Industry standards like PayPal and Authorize.net should be standard. Stripe is a pretty huge expectation. After that, the question is about variety. Are there many? Particularly for international support. Can a site owner schedule content so that a member can’t log in, download everything, and then sign out and request a refund? In essence it’s a core way people mitigate content theft. Many support scheduling content these days but a few years ago this was much harder to find. The reality is that most people don’t just spin up sites with protected content. That’s not their focus. Instead, their focus is to create a community. To support that community. And eventually to potentially monetize that community. That often means selling eBooks, physical books, t-shirts, posters and more. 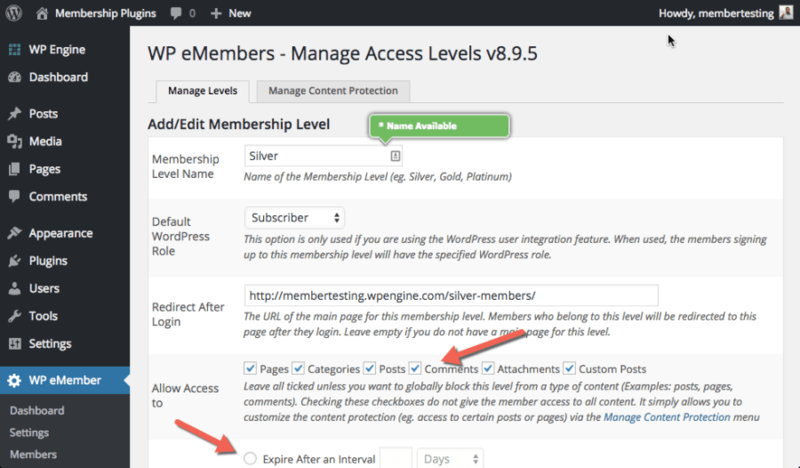 So the question is, can this membership plugin integrate or work alongside an eCommerce solution? It’s not hard to predict what this means. Can a member easily upgrade or downgrade from their current membership to another level? Sometimes the restriction is the plugin (because it doesn’t support it). Sometimes the restriction is the payment gateway. Either way, a great plugin will support both – from the assumptions made in its features to the way they’ve integrated with payment gateways. When we talk about upgrades or downgrades, it’s only logical to also want the charges to be pro-rated. But that’s not always been easy. So many plugins still don’t do it. But those that do get extra points. And the same holds true for pausing a membership. It’s a wonderful thing to have and these dynamics really do happen in the real world. So it’s not crazy to want them. Like I said, that’s not all of them, but it’s a few I keep my eyes open for. There is a lot to like about this plugin. It’s been on my radar for years and I used it on a site with over 400 active members for over 14 months. It was fantastic. There was no welcome wizard, so I had to find the menu item in my admin and look for “settings.” It was easy to find and not initially intimidating because I saw “version 8.9.5” which suggests longevity and support, and I saw 7 tabs. I say “not initially intimidating” because the General Settings tab has 50 options to choose from. Intimidation set in quickly as I imagined what it would be like if this was my first membership plugin. A general settings tab should never have 50 options to configure. I don’t know if I can claim that law as my own, or if I learned it from someone else, but for now, it’s mine. Say no to 50 options – on a single tab. A general settings tab should never have 50 options to configure. Nevertheless, there are some amazing features hidden in those 50 options (on the first panel). You get one of my “nice to have” features – the public profile directory. And you can check a box to support multiple concurrent memberships. You also get to create custom fields for those profiles (something that is regularly requested and feels like a must-have) and like Membership 2 Pro, you can create your own protection for comments. And if you keep scrolling, it gets even better. They support the Google First Click Free feature. Google comes over and scans your content. Google then puts it in its index and makes it part of search results. Google then shows it and a user clicks the link. The user gets to see that entire article on your protected site for free. When the user clicks to any other link or post, the protection rules kick in. It’s a nice way to get your content showing up in search results. But don’t worry, if you don’t like that, go up to that first screen shot in this section and look at the “more tag” protection. This allows people to see the content before the “more” tag so that Google can still capture the teaser content. Either way, WP eMember is helping you get Google to become aware of your content and to help bring traffic your way. That’s a great thing. One of the things I don’t talk about enough (mostly because I’m no expert like my friends at Sucuri) is security as it relates to your membership site. Until recently, the only security stuff I’d seen was a plugin that Norcross created with Jason from Paid Memberships Pro – called WP Bouncer. 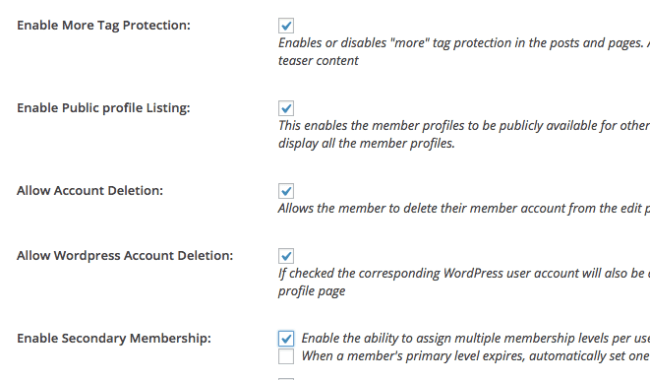 But WP eMember has it’s own support for several of those features. It can log people out after a certain length of time, it can limit how many distinct IP addresses you can log in from, and it can bounce people trying to share a login. It also has a really nice feature for people who have had their accounts expire. Instead of bouncing them (and potentially inspiring them to try to hack their way back in), it politely lets them back in, but at a free level. This of course makes it easy to renew your membership. And trust me, you should always make it easy for people to renew their membership. Always. You should always make it easy for people to renew their membership. I’ve mentioned before that these are my own evaluations and clearly my opinions. So it helps to walk you thru the couple of spots where I was frustrated. The first was that nasty old dynamic of a plugin creating pages for you automatically. As a way to help you. But should a plugin do that automatically? I’m of the opinion, no. The other thing I really didn’t love was the limited payment gateway support out of the box. Basically PayPal and ClickBank. Not so great. Until you find out they also support WooCommerce. So if you’re willing to install (or if you need to install) an eCommerce platform, you’ll get all the payment gateways they support, plus integration with WP eMember (thru an extension they offer). And while the payment gateway support was poor, the integration to eCommerce (their own, and WooCommerce) was a huge plus. I don’t want to make it sound like the page and payment gateway stuff should bother you so much that you walk away from this plugin, because it has a feature I love and I wish every plugin had. The ability, before a subscription ends, to notify a person that it will be ending soon. And an ability to send them a link to renew. I know. It sounds so basic that you’d think everyone should have it. But they don’t. Any plugin that is thinking about how I make money, and helps me, is a great one. This is one of those kinds of plugins. Any plugin that thinks about how I make money, and helps me, is a great one. It’s not a hard thing to do, but tons of plugins forget that attrition (or churn) is a big deal when it comes to membership sites. Most people don’t hang around as long as you want. And if you can proactively prepare someone and engage them, you’re in a better place to keep that recurring revenue coming in. Before I wrap this up, I can’t help but make sure that you know that content protection is every bit as good as you hope it would be – from protecting pages to categories of content, to comments, digital downloads (yes! ), and custom post types. What’s also nice is the content expiration dynamic. You can set things up so that some content is available but only for a particular window. Very nice! And WP eMember also supports a certain kind of dripping. Not exactly the standard way, but it can work for some folks. I call it sequencing by membership level and the approach is what it sounds like. You put some content into one membership level. Then other content into another level. And then you auto-upgrade them at particular intervals. So this way you can put month one content into a “month one” level, and the same for months two and three. Then you just move people from one level to another. Let’s get to the list of features you’re likely still wondering about. You can pause a membership. You can manually add a member. But there are other things you can’t yet do. You can’t integrate with BuddyPress. You can’t pro-rate any fees (even during upgrades). Ok, so let’s get to the scoring, right? How does WP eMember stack up. But remember there are those little extras that were pretty nice? They do three of the five.